This is the leet o ceeties an touns in Serbie, accordin to the criteria uised bi Statistical Office o the Republic o Serbia, which clessifies the settlements intae urban an rural, dependin nae anly on size, but an aa on other admeenistrative an legal criteria. Ceeties in admeenistrative sense are defined bi the Law on Territorial Organisation. They enjoy a special status o autonomy an sel-govrenment, as thay hae thair ain ceevic pairlaments an executive branches, as well as mayors electit throu popular vote, electit bi thair ceetizens in local elections. The caipital Belgrade is the anly ceety on the level o a destrict. Aw ither ceeties are on the municipality level an are pairt o a destrict. In addeetion, Priština is an admeenistrative ceety accordin tae the Law, but Serbie daes nae exercise its laws on Kosovo. The 2011 census in Serbie wis held anly on the territories o Central Serbie an Vojvodina, an nae in Kosovo. Accordin tae the stateestic criteria, the follaeing settlements are clessified as "urban" (i.e. ceeties an touns), as opposed tae "rural" (veelages). These criteria are nae leemitit tae settlement size, but an aa include the percentage o residents engaged in agricultur, population density etc. Thus, nae aw touns in stateestical sense are greater nor villages, an thay are nae always municipality centers. ↑ 1.0 1.1 These are 2002 census results. 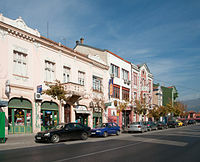 At the beginnin o September 2011, the Assembly o Albanian Deputies frae Preševo, Bujanovac an Medveđa invitit the Albanians tae boycott the Census, which affectit the coverage in the municipalities o Preševo an Bujanovac, an pairtly in the municipality Medveđa. ↑ 1.0 1.1 "2011 Census o Population, Hoosehaulds an Dwallins in the Republic o Serbie: Comparative Owerview o the Nummer o Population in 1948, 1953, 1961, 1971, 1981, 1991, 2002 an 2011, Data bi settlements" (PDF). Stateestical Office o Republic O Serbie, Belgrade. 2014. ISBN 978-86-6161-109-4. Retrieved 2014-06-27. This page wis last eeditit on 25 Januar 2019, at 07:29.